What is NCAA Clearninghouse? It's a place for Division college coaches to check to see if students meet the criteria for their college prep. Students enter in their transcript info and have their SAT and/or ACT scores sent over and the coaches take a look at the eligability. This is the website to get started. Check out this online PDF to understand how colleges and coaches use the NCAA Clearninghouse website to determine college sports elligibility for the division schools. If you are a member of Colleg Week Live, then search for the NCAA Student Athlete seminar. Explore California Careers and Colleges at California Colleges "dot edu"
This website is full of great information and research. Parents looking for a career change may find this site useful as well. Students, enter in your classes as you go and you essentially fill out your CSU college application since it's associated with their application website. How cool is that? Really cool! Have you checked out the Career Center in the library? Take a look at the Career Center's weblinks as well. You'll find scholarship information, financial aid information, and SAT prep information, NCAA information for student athletes and more! JUNIOR SUMMER PROJECT: Juniors, get a list and make it a good list of colleges that you are applying to! Every January, the counseling department meets with the junior classes to encourage juniors to continue their college and career planning. We want to make sure that every student who is planning on going to college continues their college research over the junior summer. Students are encouraged to create a list of colleges that they are going to apply to using Naviance Family Connections, the college and career planning guide on the internet. The counselors will request a printout of their Naviance list when they return to school as seniors. Students present this list when they meet with their counselor for the Senior One-One Meeting that occurs in September. Parents, please help us with this goal by encouraging college and career research over the summer and monitoring their progress. Here is a link to the presentation by the Counselors. Applying to an Out of State University or College? Check out the Western University Undergraduate Exchange Program from WESTERN INTERSTATE COMMISSION FOR HIGHER EDUCATION. Are you a high-achieving student and do you want to be get help applying to prestigious colleges? Here are two great programs to check out. QuestBridge has several programs for high-achieving students. Find out about all the programs and the deadlines here. Pheonix Scholars Program matches up Stanford University students with high-achieving High School students who are planning on applying to rigorous universities and need some guidance in the process. The application for juniors usually opens January with a deadline in the spring. However, interested students should apply early to this popular program. 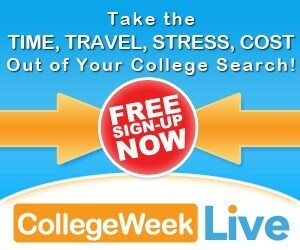 At College Week Live, view colleges with live, online tours of California colleges. Visit tons of colleges in no time. Note: You don't have to be a senior to use this site. But, you do have to register. Click on the pic below. Click here for information about ways to explore medical fields in our community and on the internet.